I created the background of this journal page with gesso, acrylic paints, inks, and tissue paper to add some texture. 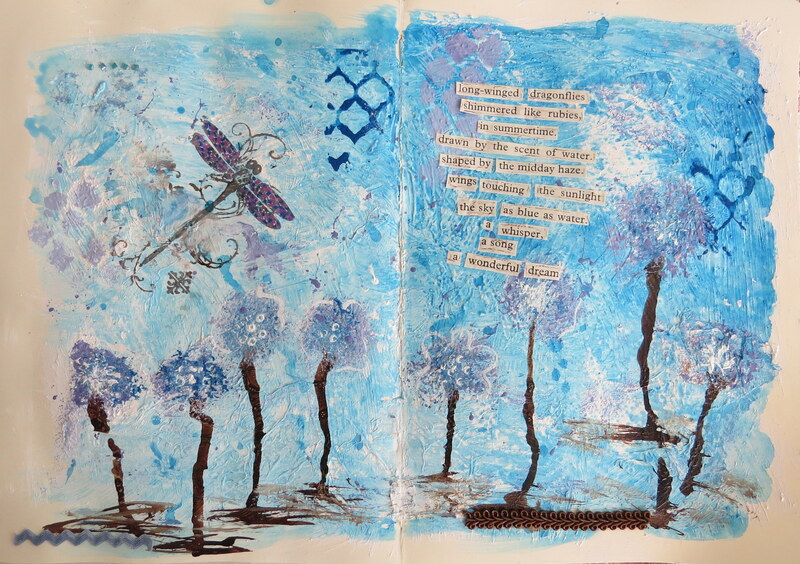 I stamped on the dragonfly and coloured it with pens, then added some scraps of trim and tiny jewels to the page. I had fun cutting words out of an old book to create a found poem. I was amazed that the book I was using, one that I had put aside ages ago to use for cutting up, had lots of words that related to my journal page. 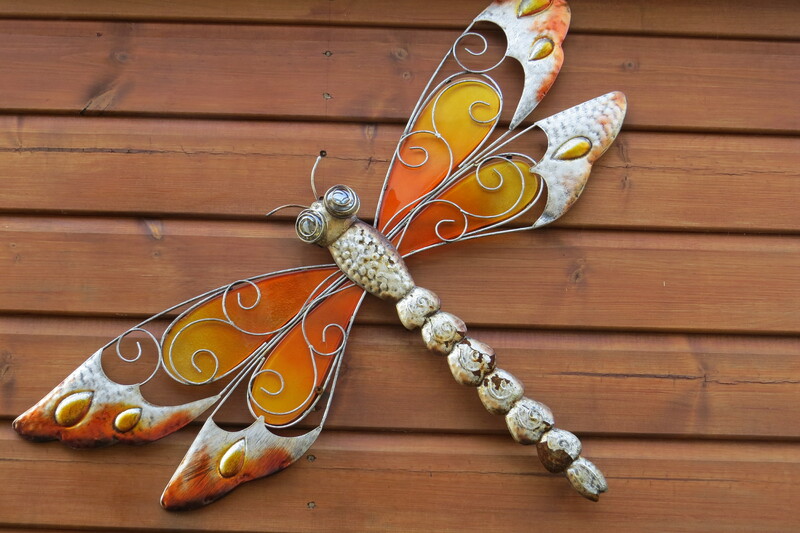 I love dragonflies and I look out my kitchen window every day onto this one that lives on the wall of my studio. I am playing along with the Things with Wings challenge at Try it on Tuesday. 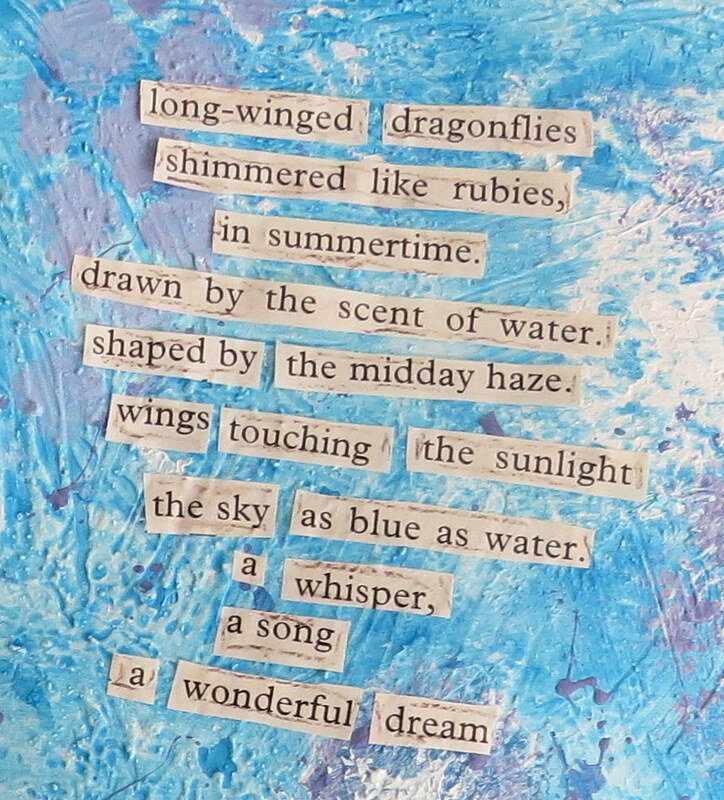 This entry was posted in art, Art journal, Crafts, Mixed-media art, My Blog and tagged art, art journal, dragonflies, found poem, Things with Wings, Try it on Tuesday. Bookmark the permalink. Lovely! This makes me want to get back into art journaling. Beautiful!! I absolutely love dragonglies. Thanks, Jo! I was inspired to join the Try it on Tuesday challenge – my first one – by seeing all the lovely journal pages on your blog that you link to the challenges! A beautiful dragonfly page – so full of motion and lovely colours and techniques! So great you joined us at Try It On Tuesday with this beautiful project! and I have seen that you even have a whole wonderful journal stared with the theme of inspiration! A beautiful blog here and I will follow you and will visit frequently ! Thank you so much, Susi! This is the first challenge I have joined. I look forward to playing along some more! Serendipitous discovery of the perfect words in the book, Kristah. Lovely! Thanks, Jane! It really was serendipitous! That is lovely, Kristah, and I particularly love the poem. Thanks, Linda! It is my first attempt at creating a found poem, and I really enjoyed the process. Thank you, Kiotta! I was lucky to find all the words for my poem on the first few pages of the book, so didn’t have to search for long! Oh this is quite pretty!